Scottrade currently doesn't offer free stock dividend reinvestment, which make it less attractive to investors who are interested in investing in dividend paying stocks. No, I haven’t done anything yet, but I am seriously considering making the move. 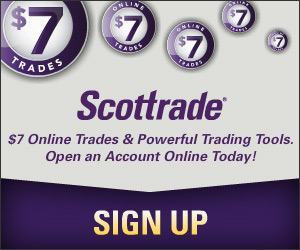 I have been a loyal Scottrade customer for more than a decade. In the past, I have said plenty of good things about the broker here, such as its customer service, trading platform, and the instant deposit feature that lets me use new fund to buy stocks without having to wait for the fund to settle. I like the last feature a lot because with other brokers, including TradeKing, I usually have to wait from 3 to 5 business days for any new deposit to be cleared before using the money in trades. Despite my overall sanctification, I have also been bothered by the lack of free dividend reinvestment option at Scottrade for years. Related: Scottrade Dividend Reinvesstment Plan? When I opened my Scottrade account in 2001, there weren’t as many selections of discount brokers as we have today and at that time, I didn’t know much about dividend and the importance of dividend reinvestment either. I just wanted a cheap brokerage account to buy stocks and Scottrade met my requirement pretty well. When I first started, I traded stocks like Lucent and Nortel, making a few quick bucks and happy with it. But I learned about stocks and dividends, I found myself buying more and more dividend paying stocks than high growth potential stocks. Because I prefer the “set and forget” approach, I don’t do a lot of trades. Owning dividend paying stocks and having the dividends reinvested allow me to manage those stocks passively while accumulating more and more shares over time. When a Scottrade branch manager told me last summer that free dividend reinvestment could come in the fall of 2012, I was very excited that the long wait could finally be over soon. But that didn’t happen and the last word I heard from Scottrade is that it’s still a “work in progress” and it could happen some time this year. I have been waiting for this for years and I feel at this point my patience is running out. Yes, I still have some commission-free trades in my Scottrade account that I can use to reinvest the dividends without paying the regular commission as Scottrade has suggested. But that’s different from free automatic dividend reinvestment, which 1) is automatic so I don’t have to remember to do myself, and 2) allows me to purchase fractional shares which is not possible for manual trading. With TradeKing, however, these are all possible under their dividend reinvestment plan, not to mention that TradeKing charges less stock trade commission than Scottrade does ($4.95/trade vs. $7.0/trade). If you are also a Scottrade customer, maybe you can also let them know (Twitter @scottrade) that this is long over due so maybe they can move a little faster on the plan. Bank of New York Mellon Corp (NYSE: BK) has paid dividends since 1785 and has a current dividend yield of 1.9%.